I love making kulfis and yet again it was mango kulfi. When mangoes are found everywhere in Mombasa, I just don’t seem to see any other fruit. The previous 2 kulfi recipes have been different. I made one with evaporated milk and fresh cream. The other one was with mawa (solid milk) and this one is using fresh cream and sweet condensed milk. It is a much quicker method than the mawa one and tastes equally good. Kulfi making has never been easier. For this recipe I used mango puree but you can use any fresh fruit puree of your choice. 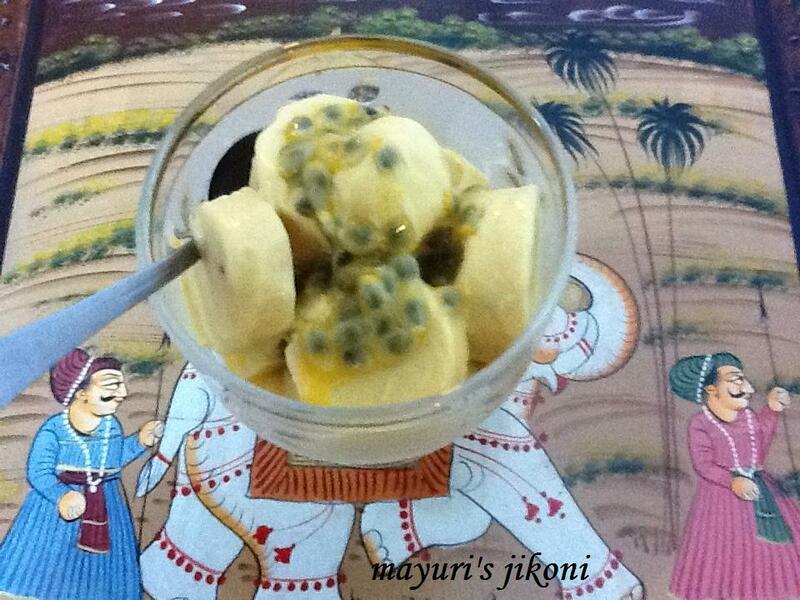 I served this kulfi with some passion fruit pulp and the sweet and tangy taste was heavenly. I have not used any artificial colours thus the dull pale yellow colour of the kulfi. Mix the milk, milk powder, condensed milk and sugar in a deep pan. Place the pan over medium heat and bring it to a boil. Stir the mixture occasionally so that it does not burn at the bottom. Lower the heat and let the milk mixture simmer for 10 to 15 minutes. It should become thick. Remember to stir it occasionally. Whip the cream till it is fluffy. Add the mango pulp, whipped cream and the flavouring to the cold milk mixture. Mix well and pour it into kulfi moulds. Freeze till the kulfi sets. Just before serving prepare the topping. Remove the pulp from the passion fruit or chop the mangoes. To serve, run the kulfi mould under tap water for a few seconds. Run the knife around the edges and the kulfi comes out easily. Slice it and add the topping. If the mango is really sweet then reduce the amount of sugar. I prefer using a non stick pan for preparing kulfi mixtures. If you don’t have kulfi moulds, freeze the mixture in small plastic cups or in small clay pots. Cover the top with foil and put a rubber band around it to avoid any crystals from forming on top. You can serve the kulfi in the containers itself. Use other fresh fruit pulps instead of mango e.g. custard apple, chikoos, strawberries, pineapple etc. Add flavourings of your choice. I want to gobble that up so fast! made it when Elo's parents came down. They loved it too.